The Matrox 4Sight EV6 Vision Controller is capable of handling multi-camera inspections with ease and efficiency. The device is offered with four Gigabit Ethernet and four SuperSpeed USB ports that enable multiple connections. The controller features RS-232/RS-485 ports, two GigE ports and a hardware-assisted mechanism for PROFINET® communication. It comes in rugged casing that makes it suitable for use in hostile, space-limited locations. MONTREAL, Quebec, 25 October 2018 — Matrox® Imaging today announces the new Matrox 4Sight EV6, the latest installment to the vision controller lineup. An enhancement of its immediate predecessor, the Matrox 4Sight GPm, the Matrox 4Sight EV6 integrates a seventh-generation Intel® Core™ processor to power ever-more demanding multi-camera applications. Matrox 4Sight EV6 possesses the ingrained power to handle multi-camera inspections with ease and efficiency. Powered by an embedded mobile-class processor, this vision controller also features four Gigabit Ethernet and four SuperSpeed USB ports, allowing for multiple connections to the full range of available GigE Vision and USB3 Vision cameras. These Gigabit Ethernet ports support power-over-Ethernet (PoE), further simplify cabling and costs. Interfacing with industrial equipment and communicating with enterprise systems is simple thanks to Matrox 4Sight EV6’s built-in connectivity. RS-232/RS-485 ports support connections to legacy automation devices while two additional GigE ports offer independent connections to work cell and enterprise networks, and include a hardware-assisted mechanism for PROFINET® communication. Integrated real-time digital I/Os with rotary encoder support help synchronize with other equipment for consistent results. 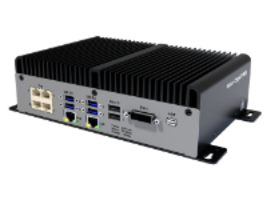 Matrox 4Sight EV6’s rugged casing ensures this vision controller fits readily into hostile, space-limited locations, while a fanless design helps reduce physical maintenance. An early-access version of the Matrox 4Sight EV6 will be available in Q1 2019.